By his own account, St. Augustine of Hippo (A.D.354-430) lived a life of sin until his conversion to Christianity at the age of 32. Twelve years later he gave a personal account of his search for truth in the Confessions. Augustine's life is especiallyappealing because it is the story of a great sinner who became a great saint, and greatness is all the more admirable if it is achieved against such odds. He paints such a black picture of his past that the reader might easily lose sight of the goodqualities which he most certinaly possessed. 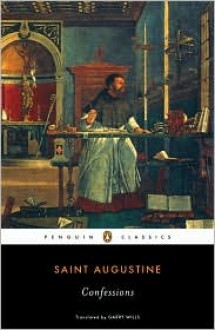 Augustine's decision to accept the Christian faith is the central point of the book. To do so he must examine his life and faith through the following progression: first, a confession of his own sin and error; second, a recognition of God's goodness and truth; thirdly, thanks and praise to God for His mercy. Augustine is led from confession of sin to confession of faith, and finally to confession of God's glory.